If you’ve ever wanted to bring the brightest day into the blackest night, this flashlight shall give you sight. With a 100W LED array powered by up to 32V, this thing is exceedingly bright — it clocks in at about 9000 lumens! But the best part is that all every little detail of the build was documented along the way so that we can tag along for the ride. The all-aluminium case houses the LEDs and their heat sink, voltage regulator and display, the AD and DC adapter and converter boards and their connectors, and fans to ensure adequate ventilation. It’s powered by a custom-assembled 6400 mAh 11.1V lipo battery or DC 20V 10Amp power supply via XLR for rugged, locking connection. The battery pack connection was vacuum formed for quick-swapping, and the pack itself will sound off an alert if any of the three batteries inside the pack run out of power. A nifty added feature is the ability to check the remaining charge — especially useful if you’re looking to bring this uncommonly powerful flashlight along on camping trips or other excursions. 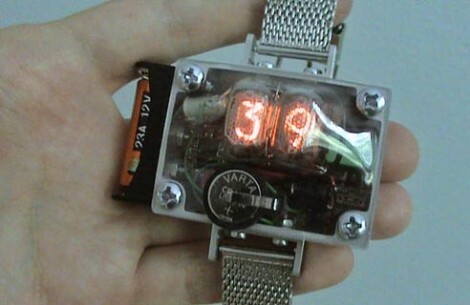 This bulky package is a Nixie tube wristwatch. We still like [Woz’s] watch better but this one has a few nice tricks of its own. Notably, there aren’t any buttons to set the time. Instead, a large magnet is used to actuate a magnetic switch inside the body. Speaking of enclosures, the case is aluminum and the face plate is polycarbonate but looks like it’s been vacuum formed. Check out the clip after the break. Vacuum formers are still fairly rare in our community, so it was a surprise to see that in the 1960s Mattel marketed one as a toy. It used a hot plate to mold plastic sheets into various shapes. The design was updated by Toymax in the early ’90s to use a light bulb heating element to make car bodies, like some sort of manly Easy-Bake Oven. The home-built machines we’ve seen are a much larger scale. In 2005, we posted [Ralis Kahn]’s version that employed an electric grill as the heating element. [drcrash] has since built on those plans, hoping to develop an even cheaper device.